Aid to remembering your pin numbers. Stores your pin number within a table of random numbers which you print out. Easily retrieve your number using word keys. A Pin Wizard guides you step by step converting your pin number into words keys. Zoom feature allows a smaller table to be used. Use at your own risk. Aid to remembering your pin numbers. Print out a table with your pin within it. 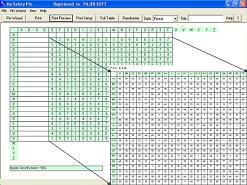 ...... number table then your given the option to immediately print out the full table. Where the numbers go is up to you! You can place them very securely over the full table or for less secure options close together to make it easier to remember. Who is it aimed at? Any one who has a poor memory for numbers. This covers a wide group. Some people often have more than one card and its is becoming really hard to keep up with all your pin numbers. My Safety Pin can print out tables for all your extra pin numbers so you never have to worry about remembering them. Another group can suffer from stress or panic when approaching a pin machine, this can affect their memory - My Safety Pin can come to the rescue by giving you the confidence to know your number is on print out in your pocket ready to use anytime you need it. Ping other computers on your network with this multifunctional tool. Pinao is an extremely addictive variation of the famous Lines game. Complete survey solution for any platform featuring flexible survey design. Myflag Wallpaper Thats Fully Integrates With Windows Setup Screen Utility. MyRide - If you love your ride (vehicle, motorcycle, etc. ), you'll LOVE MyRide! MyLife - Your ULTIMATE Alarm, Reminder, Scheduler, Organizer, and MUCH more! MyCash - The BEST Checking Account Software for Personal / Small Business Use! For friends of the timeless Arcade games there is the old Qix in a new dress! Qweas is providing links to My Safety Pin 1.1 as a courtesy, and makes no representations regarding My Safety Pin or any other applications or any information related thereto. Any questions, complaints or claims regarding this application My Safety Pin 1.1 must be directed to the appropriate software vendor. You may click the publisher link of My Safety Pin on the top of this page to get more details about the vendor.